The parish of Pendeen encompasses several hamlets; Bojewyan, Boscaswell, Lower Boscaswell, Trewellard, Carnyorth and Levant being the main ones. 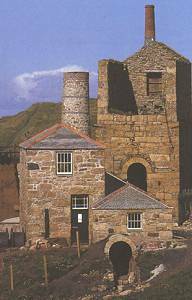 Renowned for its copper and tin mines Pendeen grew in size to serve the mining community until the turn of the century. With the decline of the industry many of its sons emigrated seeking new lives in mines opening up all over the world and there are few old families without some connection to America, Australia , South Africa and other mining areas. 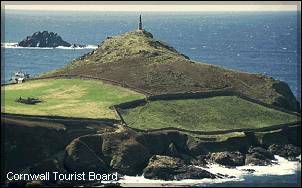 Pendeen Watch : The dramatic Pendeen lighthouse is situated on the slate promontory of Pendeen Watch. This part of the coast is renowned for the number of ships wrecked on the rocky headlands. Portheras & Boat Coves : small sandy coves nestling under granite cliffs. Levant Engine House : This lovingly restored steam engine run by the National Trust is a splendid symbol of the once vigorous Cornish Mining Industry. 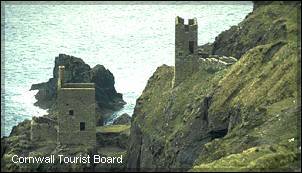 Levant features in to 2015 TV series, "Poldark". The mine is transformed into the Tressiders Rolling Mill in the Series. Geevor Mine : The famous mine ceased working tin only a few years ago but has been reopened as a Heritage Museum with tours of underground and surface workings. 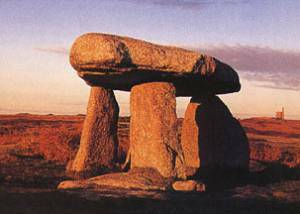 Ancient Sites : The moorland hills of the Land's End peninsula boast a remarkable concentration of Bronze and Iron Age relics dating from 4000BC; standing stones and stone circles abound. Pendeen Fogou : An ancient underground chamber dating back to the 1st century BC may be visited by permission of Pendeen Manor Farm. Pendeen Carn : The Carn (Cornish for hill) rises behind the village and affords a pleasant stroll with magnificent views over both moor and coast. Carn Kenidjack : Natural rock formation also known as the 'hooting carn' due to the noises made by the wind whistling through the weird stone shapes.